Noob here! Please let me know if this doesn't belong here or something else is wrong with my question. I have been playing around with arduinos for a few weeks and wanted to try to breadboard micro-controller. I'm trying to burn a bootloader to this one but having problems. The arduino "burn bootloader" function gave me some errors so I tried to burn it from the command line using AVRDUDE and got the same errors (see below). 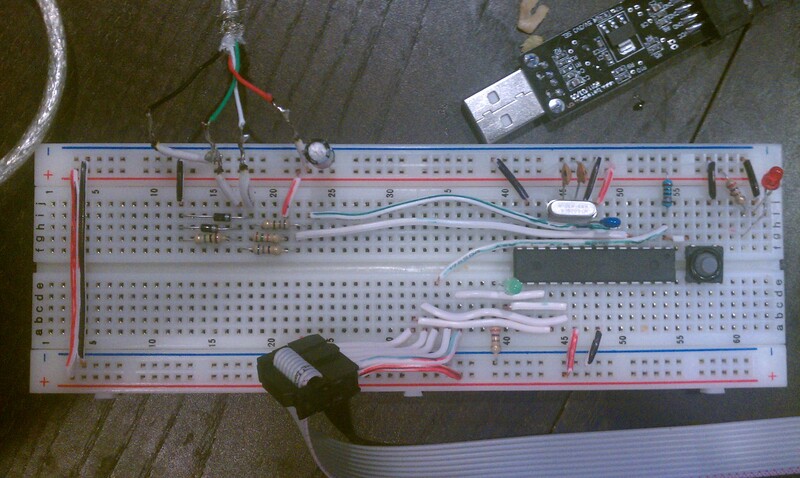 USBasp prograamer hooked up to an ATmega328-PU chip on a breadboard. First off. You have done a brilliant post. Especially you neat breadboard with the wires colour-marked. The ArduinoISP sketch should work perfectly. Just follow the Arduino tutorial. Especially check all your wires. Change the 'com1' to whichever COM # your Arduino is on. Your photo shows an usbasp. Install the usbasp driver and everything should work. Go to http://www.fischl.de/usbasp/ for a driver. It looks as if you have an ATmega328 chip. This is different to a ATmega328P, but only the Signature bytes. In all other respects it will work fine. You should get an answer. Probably saying the Signature is 1E 95 11 or something. 1. the usbasp should be found. 3. it should say a correc signature. If you do do get this working, let us know. WE can show you how to recognise the mega328 chip. And I am expecting some identical usbasp in the post shortly. Thanks! I'm glad I didn't get a LMGTFY or some variation of it. The ArduinoISP sketch should work perfectly. Just follow the Arduino tutorial. I can't follow the tutorial exactly yet because I don't have the sparkfun usb to serial converter (I just ordered one) I didn't think I needed it because I wanted to use v-usb but it will probably be nice to have. I also ordered their breakout board for the 10 pin connector, it was only $1. Especially check all your wires. Install the usbasp driver and everything should work. Go to http://www.fischl.de/usbasp/ for a driver. It worked! (see below AVRDUDE_works.png) What does that section mean when it says "cannot set sck period"? I then tried to burn the bootloader I want to use (see below AVRDUDE_works2.png)but had to force it with -F. I think I had to do this because the ATmega328 was not on the list. I think it worked! I'll let you know, I need to figure out how to test it now. Thanks for the help David and all those who looked. This is fine. Many Chinese usbasp firmwares detect the SCK speed automatically. Hence they do not respond to avrdude setting SCK. This is very handy for you because any virgin AVR needs to be programmed relatively slowly ( 1MHz needs -B5 ). Your usbasp uses the best speed that it thinks is suitable. I really do not like anyone using -F unless they know what they are doing. Since you have got a good signature 1E9514 for a mega328 everything will be ok. The best solution is to edit the "avrdude.conf" file. 1. Identify the "ATmega328P" entry. 2. Copy-paste the complete entry. Now you never need to lie ! Use 'avrdude -p ATmega328' in the proper manner. You deserve a prize for an excellent post. I am not too sure what "LMGTFY" means. But your experience certainly shows that a well presented question gets solved with ONE reply. Your time was very well spent. Sometimes these threads go on for weeks !! If you have a regular Arduino, you need no extra parts at all to use the ArduinoISP sketch for programming. Ah-ha. Perhaps I should have googled that for myself ! I still cannot get over how excellently HyrumF's question was composed. Especially the quality of his photos and the simple things like using coloured wires on a neat breadboard. If only everyone took such care. Every thread would only be two or three posts in length. Incidentally I am still waiting for some identical usbasp boards to arrive from China. Is that the model that you bought? I don't have a USBAsp. Someone else perhaps? PS Agree that OP is a great example of how it should be done! I compiled one of the latest avrdude (SVN1039) from January 2012, it includes new CPU and various bugfixes, try it! I realized I was talking a risk there but I thought it would work after what I read. Also, I kinda expect to screw something up which is why I bought 4 chips instead of just 1. As you may have noticed the bootloader I was loading was USBaspLoader. ( from http://www.obdev.at/products/vus... ) I'm trying to use V-USB. Once I had it loaded I re built my board to match the metaboard ( https://metalab.at/wiki/Metaboard ) and grounded PD7 so the bootloader would take over. I then plugged in the usb and it immediately recognized as a USBasp. it was only $4 with free shipping. I don't know how they do it! By the way, could these be reprogrammed into an arduino with 4 I/O? My three USBasp boards have just arrived. $3.99 each. I am just about to 'have a play' e.g. test the supplied firmware, install some different firmware. You unsolder/solder a 0R resistor to select 3.3V or 5V or no_vcc. You need to solder a 0.05" header to Self-Program. The supplied firmware is locked. As far as I can see, these $3.99 boards do what they say on the tin. After all, most people just want to 'ISP and go'. My original usbasp cost about $10 but it had regular 0.1" pads so I could solder regular 0.1" headers. IMHO this makes it worth the $10. Hey guys, sorry to re-open this but I'm still having a problem. C:\Arduino\arduino-1.0\hardware\arduino\cores\arduino/Arduino.h:212:26: error: pins_arduino.h: No such file or directory"
avrdude: error: could not find USB device "USBasp" with vid=0x16c0 pid=0x5dc"
I double checked the device manager and USBasp is there. did I screw something up here? I was thinking this probably belongs in the arduino forums but since I already had this thread I thought I would try here first. Maybe my question wasn't clear. 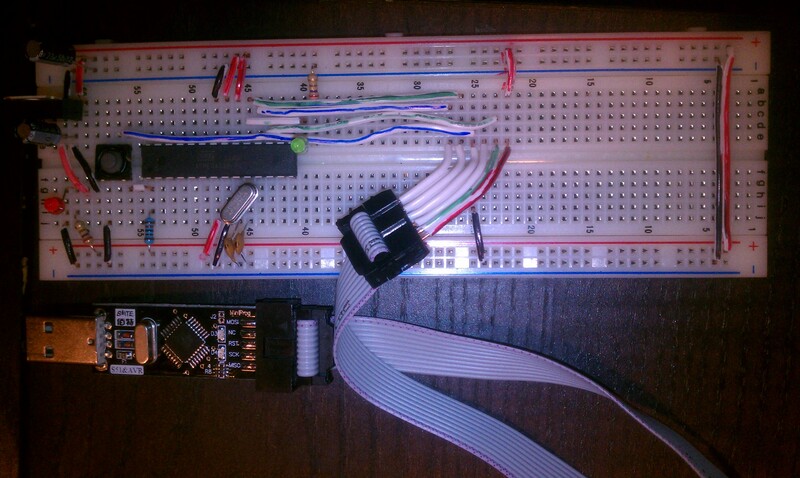 What I am trying to do is build a metaboard on a breadboard. (I purchased a metaboard kit a while ago but it still isn't here) The metaboard uses a bootloader that, when enabled, shows up as a USBasp and allows you to upload sketches to it through vusb. When you say "they" you are saying me! LOL and I admit that is likely the case! It seemed to upload fine using the programmer I bought from China. When I plug it into my usb port it with PD7 grounded it and then press the reset button it is recognized as a USBasp, just like it should. So I think the bootloader/firmware uploaded correctly so I set my programmer aside and then tried to uses the bootloader to upload a sketch. This is where I had the problem. V23 of Arduino says that it is looking for vid=0x16c0 pid=0x5dc which I think is the same. the only difference is usbdeview shows a zero in front of the 5dc. Are these equivalent? If they aren't, is this something I can change? It looks like the source code for the bootloader is there but I looked though it (not knowing what I was looking at) and couldn't find the PID or VID called out. Thanks for the help! As always I'll keep looking for these answers myself but any tips are appreciated! usbdeview was a great one! So maybe avrdude did locate that vid/pid but it didn't respomd in the way avrdude was expecting it to? If you add -v to the avrdude command line it tells you more about what's going on. If you keep adding v's it keeps telling you more detail. I think the ultimate is -vvvv. Might be worth a try. Unplug and re-plug the USB cable. If your fuses are correct i.e. BOOTSZ & BOOTRST then your bootloader should register the 'usbasp' device. If USBview or Device Manager can see it, so should avrdude. I have not got the energy to try your bootloader app this evening. If you are still struggling tomorrow, shout, and I will give it a go on a mega168. somewhere else so the IDE can find them. C:\ProgramFiles\arduino-0022\drivers\USBasp. * where setup information for arduino UNO and MEGA 2560 is found. His problem looked just like mine so I did what he said and it works now.